Chemistry is not the preservation hall of old jazz that it sometimes looks like. We cannot know what may happen tomorrow. Someone may oxidize mercury (II), francium (I), or radium (II). A mineral in Nova Scotia may contain an unsaturated quark per 1020 nucleons. (This is still 6000 per gram.) We may pick up an extraterrestrial edition of Chemical Abstracts. 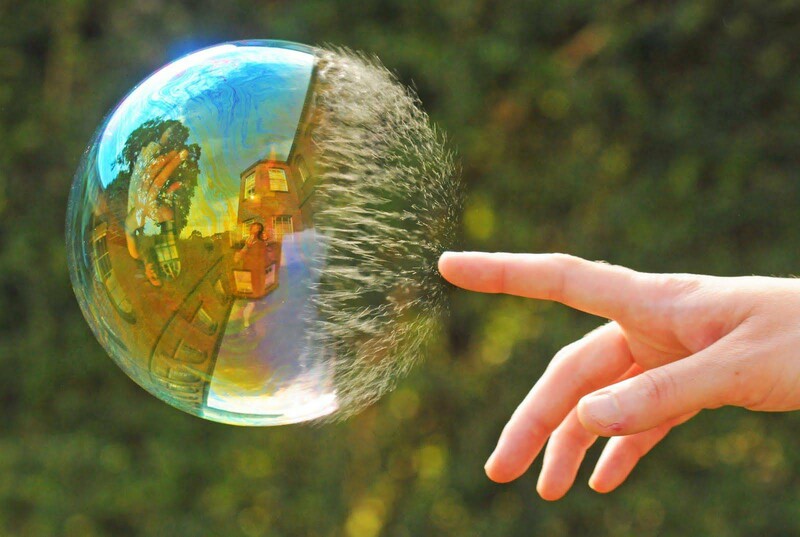 The universe may be a 4-dimensional soap bubble in an 11-dimensional space as some supersymmetry theorists argued in May of 1983. Who knows? George B. Kaufmann, 'Interview with Jannik Bjerrum and Christian Klixbull Jørgensen', Journal of Chemical Education (1985), 62, 1005. Astrophysicists closing in on the grand structure of matter and emptiness in the universe are ruling out the meatball theory, challenging the soap bubble theory, and putting forward what may be the strongest theory of all: that the cosmos is organized like a sponge. 'Rethinking Clumps and Voids in the Universe', New York Times (9 Nov 1986), A1. 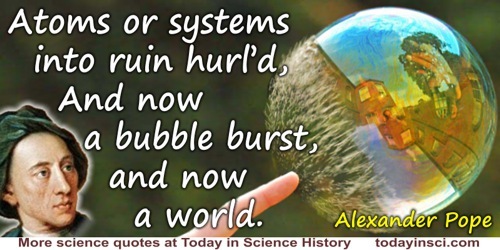 And now a bubble burst, and now a world. From An Essay on Man (1734), Epistle I, lines 89-90. In An Essay on Man: enlarged and improved by the author. With notes by William Warburton (1745), 5. Consider now the Milky Way. Here also we see an innumerable dust, only the grains of this dust are no longer atoms but stars; these grains also move with great velocities, they act at a distance one upon another, but this action is so slight at great distances that their trajectories are rectilineal; nevertheless, from time to time, two of them may come near enough together to be deviated from their course, like a comet that passed too close to Jupiter. In a word, in the eyes of a giant, to whom our Suns were what our atoms are to us, the Milky Way would only look like a bubble of gas. Science and Method (1908), trans. Francis Maitland (1914), 254-5. Everyone working in science, no matter their politics, has a stake in cleaning up the mess revealed by the East Anglia emails. Science is on the credibility bubble. If it pops, centuries of what we understand to be the role of science go with it. In D. Henninger, 'Climategate: Science is Dying', Wall Street Journal (Dec 2009), A21. From 'Song of the Brook' (1842), collected in The Poetical Works of Alfred Tennyson (1873), 142. In my considered opinion the peer review system, in which proposals rather than proposers are reviewed, is the greatest disaster visited upon the scientific community in this century. No group of peers would have approved my building the 72-inch bubble chamber. Even Ernest Lawrence told me he thought I was making a big mistake. He supported me because he knew my track record was good. I believe that U.S. science could recover from the stultifying effects of decades of misguided peer reviewing if we returned to the tried-and-true method of evaluating experimenters rather than experimental proposals. Many people will say that my ideas are elitist, and I certainly agree. The alternative is the egalitarianism that we now practice and I’ve seen nearly kill basic science in the USSR and in the People's Republic of China. Alvarez: Adventures of a Physicist (1987), 200-1. It behooves us always to remember that in physics it has taken great men to discover simple things. They are very great names indeed which we couple with the explanation of the path of a stone, the droop of a chain, the tints of a bubble, the shadows of a cup. In On Growth and Form (1917). Looking back across the long cycles of change through which the land has been shaped into its present form, let us realise that these geographical revolutions are not events wholly of the dim past, but that they are still in progress. So slow and measured has been their march, that even from the earliest times of human history they seem hardly to have advanced at all. But none the less are they surely and steadily transpiring around us. In the fall of rain and the flow of rivers, in the bubble of springs and the silence of frost, in the quiet creep of glaciers and the tumultuous rush of ocean waves, in the tremor of the earthquake and the outburst of the volcano, we may recognise the same play of terrestrial forces by which the framework of the continents has been step by step evolved. Lecture at the Evening Meeting, Royal Geographical Society (24 Mar 1879), 'Discussion on Geographical Evolution', in Proceedings of the Royal Geographical Society and Monthly Record (1879), New Monthly Series, 1, 443. In 'Report of the Secretary', Seventh Annual Report of the Board of Regents of the Smithsonian Institution for 1852 (1853), 15. One night we were hauling long lines on the Faroe slope, working with an electric lamp hanging over the side in order to see the line, when like lightning flashes one squid after another shot towards the light; … In October 1902 we were one night steaming outside the slopes of the coast banks of Norway, and for many miles we could see the squids moving in the surface waters like luminous bubbles, resembling large milky white electric lamps being constantly lit and extinguished. From Sir John Murray and Johan Hyort, The Depths of the Ocean (1912), 649. The vortices of Descartes, gave way to the gravitation of Newton... One generation blows bubbles, and the next breaks them. From Letter (29 Sep 1783) to Rev. William Unwin, collected in William Cowper and William Hayley (ed. ), The Life, and Posthumous Writings, of William Cowper (1803), Vol. 3, 196. The overwhelming astonishment, the queerest structure we know about so far in the whole universe, the greatest of all cosmological scientific puzzles, confounding all our efforts to comprehend it, is the earth. We are only now beginning to appreciate how strange and splendid it is, how it catches the breath, the loveliest object afloat around the sun, enclosed in its own blue bubble of atmosphere, manufacturing and breathing its own oxygen, fixing its own nitrogen from the air into its own soil, generating its own weather at the surface of its rain forests, constructing its own carapace from living parts: chalk cliffs, coral reefs, old fossils from earlier forms of life now covered by layers of new life meshed together around the globe, Troy upon Troy. In Late Night Thoughts on Listening to Mahler’s Ninth Symphony (1984), 22-23. What is the shape of space? Is it flat, or is it bent? Is it nicely laid out, or is it warped and shrunken? Is it finite, or is it infinite? Which of the following does space resemble more: (a) a sheet of paper, (b) an endless desert, (c) a soap bubble, (d) a doughnut, (e) an Escher drawing, (f) an ice cream cone, (g) the branches of a tree, or (h) a human body? The Fourth Dimension: And How to Get There (1985), 91. When I began my physical studies [in Munich in 1874] and sought advice from my venerable teacher Philipp von Jolly...he portrayed to me physics as a highly developed, almost fully matured science...Possibly in one or another nook there would perhaps be a dust particle or a small bubble to be examined and classified, but the system as a whole stood there fairly secured, and theoretical physics approached visibly that degree of perfection which, for example, geometry has had already for centuries. From a lecture (1924). In Damien Broderick (ed. ), Year Million: Science at the Far Edge of Knowledge (2008), 104.